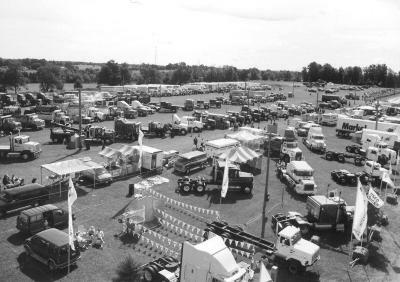 In 1986, the Fergus Truck Show was established as a one-time event to raise funds for the Fergus & District Community Centre Complex Hall addition and to introduce area residents to the trucking industry. Today the Fergus Truck Show has grown to be North America’s largest truck show, both in paid attendance and the number of the big truck ‘Show & Shine’ contestants. The Fergus Truck Show is the major community fundraising project for the 24 plus groups assisting in various functions at the annual 4th weekend in July event. The groups include: Alma Optimist Club, Arthur Optimist Club, Belwood Lions Club, Centre Wellington In-Line Hockey, Country Wings, CWDHS Missions, Elora Mohawks, Fergus Devils Junior Hockey Club, Fergus Tennis Club, Grand Harmony, Tri City Football, Highland Rugby Football Club, Melville United Church, Men for Missions, Centre Wellington Rotary Club, Royal City Ambassadors, Fergus Lions Club, Community Resource Group, Fergus Boy Scouts and Fergus Curling Club. To date, the Fergus Truck Show has donated more than $600,000 in cash and donations to the various groups assisting and to the Centre Wellington Community Sportsplex (Fergus Community Centre). The weekend event has resulted in approximately 80 million dollars in economic benefit for the Community. In February 1997 the Fergus & District Chamber of Commerce presented the past and present directors of the Fergus Truck Show with the 1996 Recreation Award. In 2003, 2005 through 2009 the Fergus Truck Show has been named one of Ontario's Top 100 Events as well as the recipient of the Centre Wellington Chamber of Commerce "Tourism Impact Award". The Fergus Truck Show takes a year-round role in the positive promotion of the trucking industry by answering inquiries related to the industry (where to go and how-to questions), as well as participation in community safety events/programs, and speaking to groups. We are also good listeners for industry individuals with concerns and problems. The Fergus Truck Show is proud to feature over 150 million dollars worth of trucks, trailers, equipment, accessories and more, on display. The event is held at the Centre Wellington Community Sportplex (formerly known as Fergus and District Community Centre), located at 550 Belsyde Avenue, Fergus, Ontario. The recreational complex includes 2 ice pads, an indoor pool, halls, kitchen, meeting rooms, and an exercise room. The outdoor complex consists of 65 well-groomed acres, including ball diamond, soccer and rugby field, children’s playground, plus a treed rough camping area. There is limited access to water and hydro throughout the grounds. The Fergus Truck Show also rents space for off site parking. There is rough camping (some sites have hydro) available at the grounds. (water fillup & a sewage dumpoff area is also provided). Camping is available on the grounds from Wednesday to Sunday of the show weekend. Additional camping is available within a 15 minute radius of the show & motels within 10 minutes. Fergus is located approximately 60 miles (100 kms) west of Toronto, Ontario, Canada. If coming from Toronto on Highway 401, exit North on Highway # 25, go north through Acton. Turn left on Wellington Rd 124.Then turn right on Wellington Rd 29 go approx. 10 miles. Turn left on Wellington Rd.18.